We're just a little EXCITED!! Devin will have his first official game in February and I CAN'T WAIT!!! My whole family is anticipating the baseball season with more enthusiasm than I thought possible. 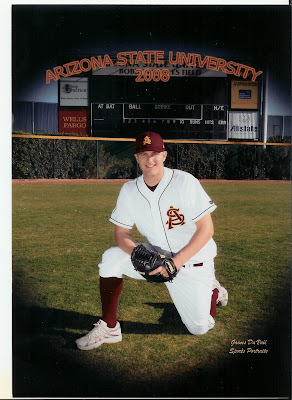 Since Devin doesn't check my blog I can brag knowing that his head won't grow any bigger....Baseball America ranked ASU to be #1 in the Nation this year!! 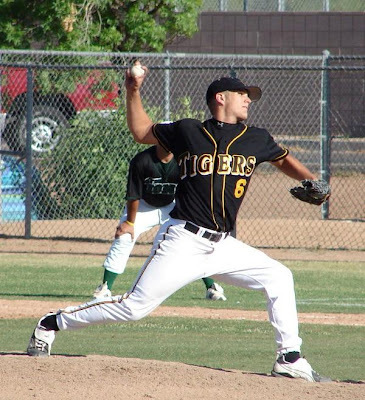 "High School: A 2007 graduate of Gilbert High School in Gilbert, Arizona...was a four-time letter winner in baseball, including his senior season when he was team captain...also won three letters on the football team...three times was named All-Fiesta Region (2005-07) and earned All-State honors in 2007...went 6-3 on the mound his senior season, including a miniscule 0.93 ERA...teamed with current Devils Adam Bailey and Matt Newman on the Arizona Firebirds, winning the 2006 Connie Mack World Series. 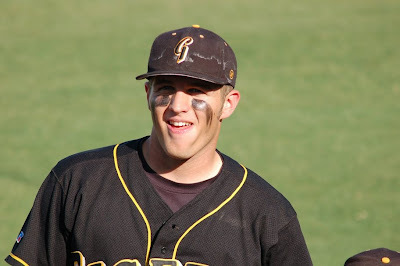 MLB Draft: Selected in the 14th round (446th overall) by the Los Angeles Dodgers in the 2007 Major League Baseball draft."